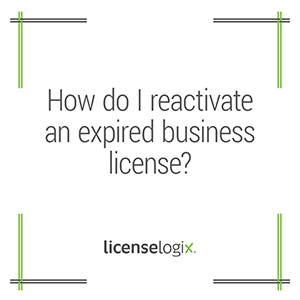 How do I reactivate an expired business license? The procedure varies state to state and depends on how you ceased operation. For example, in some states you could simply file for a renewal and pay a penalty fee for the late filing. In other states you might need to start the process of obtaining a business license all over again. Contact the Secretary of State. The answer also depends on whether you dissolved the business with the Secretary of State. You would need to check with the Secretary of State in which the business was originally established to confirm that it was officially dissolved. In most states if the business was in good standing the process to reopen will be easier. Contact the Department of Revenue. You will want to contact the department of revenue to confirm that your state Tax Identification number is still valid and in good standing. If you have missed any tax filings you will need to bring your account back to good standing. Contact the IRS. Some information you currently have can still be used. The business’s EIN number from the Internal Revenue Service is like the business’s Social Security Number and will forever be assigned to your business. If you called the IRS to deactivate the EIN you will need to call them and update and activate the business EIN number. Contact LicenseLogix to help! LicenseLogix offers a business license verification service to ensure that all your business licenses are active and in good standing if we find one that is not we can complete the license application for you and make sure your business is legally compliant and ready to open its doors again. For more information on LicenseLogix services and how we can streamline business licensing for you please contact us by clicking our live chat function, submitting a question to our licensing team or simply call us at (800) 292-0909.